Similar to StartAsRoot for FileCase, but created as patch. 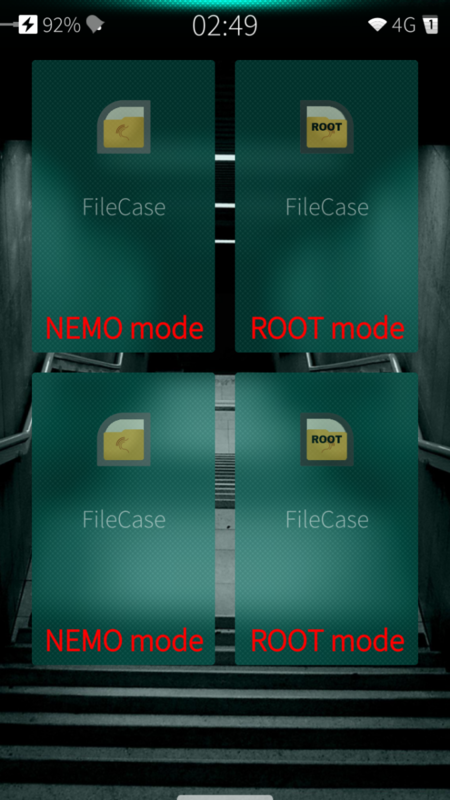 It add indicators "NEMO" and "ROOT" to the cover (see screenshot) and you also can open more than one windows as nemo. 1. Don't forget to unapply patch before you update/reinstall FileCase app! 2. For both Phone and Tablet users - if you update or reinstall FileCase app, you need to UNINSTALL and reinstall this patch (sorry for inconvenient). - Fixed white screen of FileCase after first install. - Fixed path to sdcard (for v2.2.0.29). - If need more, ask on openrepos: https://openrepos.net/content/schturman/patch-startasroot-filecase. - Added some new extensions (.c, .py, .qml, .js, .patch, .log, .sms) to allow editing as text. If need more, ask on openrepos: https://openrepos.net/content/schturman/patch-startasroot-filecase. - Visible full path to the current folder. Any plans to do a root patch for the new Fileman? Will check when I have time. About FileManagers, I don't change nothing in the apps itself, why it not change colors under root, I don't know. I have a problem by removing the patch. I get the message in the Screenshot every time i try to update a warehouse-app. Probably you updated or reinstalled FileCase app without unapplying patch. This is a reason for your problem. I can not use filecase on my XA2 Plus with Sailfish OS 3.0.1.14. What it say when you trying to install ? Try to install via terminal and show output. It doesn't work in patchmanager 3.0 on my Xperia XA2 Plus.